By Alex Hamilton on June 7, 2014	in Phoenix Comicon 2014, Q&A. Permalink. Prior to seeing Sheppard’s name come up on the Phoenix Comicon guest list some months ago, I had only recognized Mark Sheppard from Firefly and Leverage. Apparently he was also in Battlestar Gallactica, Dr. Who, and about 55 other things, plus still has a spot in Supernatural. I’ve been duly informed. I was also surprised to see just how many people were waiting for his panel. “Lines at a con?? ?” *shockface* No, not shocked at a line…just shocked by the line for him. Apparently his a bigger deal than I realized with us nerds! For the record, Sheppard absolutely killed it. Witty, engaging, sincere, and captured the audience from the moment he walked on stage…twas a definite joy to be there! What will follow is a selection of Q’s, A’s, and general quotes from the panel. Because of Mark’s style, sometimes you’re not sure if a question has been asked, and if it has, it’s quite easy to forget. Many times, however, the question is irrelevant – it’s the musings that pour out of his mouth that matter, and he’s not stingy with them. MS – That’s not good enough. MS – “Is moose and squirrel…” or “Are moose and squirrel…”? I can never remember. MS – I am 50 years old. I never planned on that. Never expected it to happen. In fact, I did everything I could to prevent it from happening. MS – Oh, you guys watch Dr. Who? [claps] Huh, never saw it. You’ll have to tell me how it is. MS – [Gets handed a cup of tea from the back] I love tea. Random fan – That’s because he’s ten feet taller than you! MS – Ten feet taller!?!? Listen missy… [pregnant pause]…I’m only short on Supernatural! MS – I love (video) games! So much so that Xbox gave me a red developer box. Had to give it back, though. They don’t let you keep those. MS – Y’know, fifteen years ago you’d have been beaten up for wearing that. I think it’s the most fantastic thing that I can go to Phoenix, or San Diego, or Chicago, or the Middle East, and you guys are all wearing your hearts on your sleeves. You’re wearing what you love! Now, instead of beating us up, they’re actually pandering to us!!! MS – All we’re (the TV cast and crew) looking for is for you to love our work as much as we did making it. It’s the most amazing thing to hear ooohs, aaahs, and gasps at screening parties with fans. On that note, it’s time for a small break in the action. Sheppard just commented on something that I actually witnessed first hand, although on a slightly smaller scale. The band Five Iron Frenzy announced a couple years ago that they were getting back together after a multi-year hiatus and tried to Kickstart an album to the tune of $30k. They raised that in the first hour, and collected well over $200k in total. One of the Kickstarter pledge rewards was to attend the album pre-release listening party with the band up in Denver. That pre-release party marked the first time that anyone other than friends and family had previewed the album, and it’s hard to tell who had a better time – the fans, or the band. As the music was playing over the PA and the fans were dancing and drinking their beer, you could see the band members get these huge smiles on their faces and clink their glasses in toast to one another. Seeing their fans appreciate their art as much as they loved creating it was quite the genuine thrill for them, and after hearing Sheppard riff on this same subject I can’t help but suspect that this is a common joy among all artists. 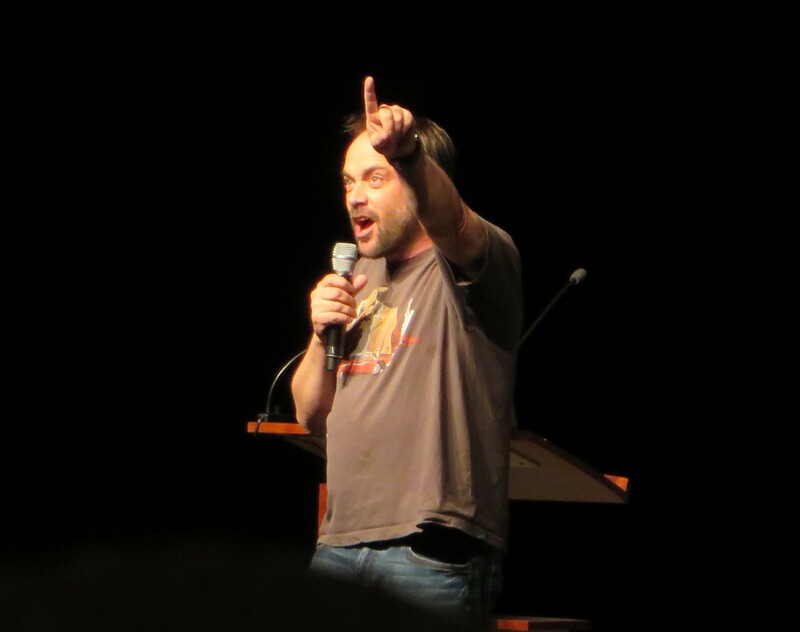 Okay, now back to your regularly scheduled Mark Sheppard. Q – Did you know before working on Firefly that it would be (such an incredible cast and crew to work with)? MS – Absolutely not. It was incredible. I didn’t know that Nathan Fillion was gonna make me sandwiches and ask how I’m doing…Did you know that originally Joss Wheddon wanted to play Badger? Yeah, he wrote Badger for himself. No wonder he was riding me like a horse all the time!…You want to know why you miss Firefly so much? We miss Firefly so much because it was STOLEN from us. It didn’t die – it was taken away. Q – What is your favorite part about playing Crowley? MS – [points to waist] From here down….I get to blow a pinwheel while I’m torturing someone. It’s insane! Q – If you were the writer, director, and producer, how would you end Supernatural? MS – As it should be – with Crowley in a bath listening to Norwegian death metal. MS – I’ve never played villains. I’ve played characters with values diametrically opposed values to yours. They’re not evil. Evil is always in the eye of the beholder. MS -Never, ever, EVAR cross the fan streams! There are many things that are great out there. Why mess with greatness? Fan – Squaresoft and Disney crossed and that was pretty great (referring to the Kingdom Hearts series). By the reaction of the audience – myself included – that might have been the most unpopular thing Mark Sheppard has ever said. Turns out that Kingdom Hearts is pretty darn good and beloved by many. I’m not sure he meant to say that it wasn’t great. Instead, I think he was simply trying to get fans to critically question how blending two universes that were great on their own could yield an equally great or better product, to which he has a valid point. There are few instances where this has been well executed, and I’m guessing Sheppard wasn’t quite expecting the fan to so witfully and accurately toss that example out as a counterpoint. MS – Why do we love sci fi? Because it uses imagination! Think about it. How many more crime procedurals can we watch, unless they’re in space?